A tractor-trailer operator sustained serious injuries to his shoulder and face while attempting to remove wood lodged between the two tires on the truck’s rear axle. While trying to remove the wood with a chainsaw and axe the tire blew out, throwing the worker backward. DO NOT use chainsaws, hammers or axes to dislodge embedded items. When possible, use a stone ejector mechanism instead. Deflate both tires to reduce the chance of tire damage or explosion. Have the tires on the vehicle serviced by authorized personnel. 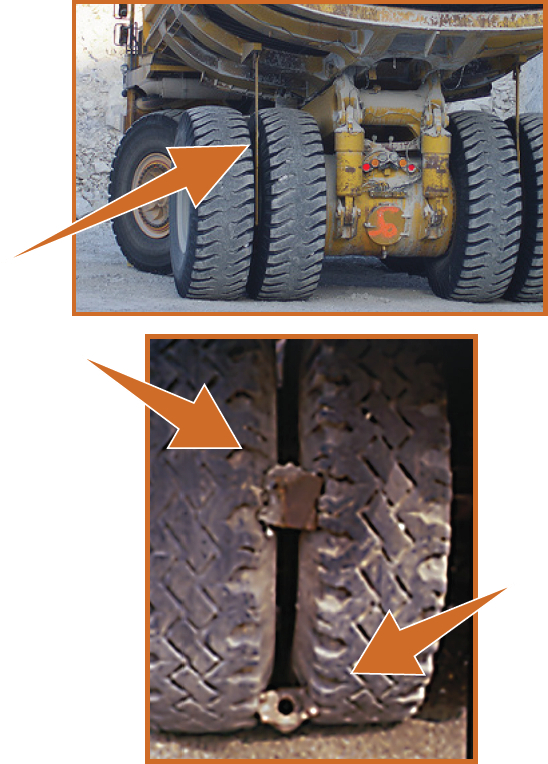 Secure a lashing chain around the item wedged between the tires and attach the chain to the frame. Ensure no employees are near the truck. Move the vehicle forward slowly until the debris is dislodged. Have the tires on the vehicle serviced by authorized personnel as soon as possible. For safety-related tire problems, contact Transport Canada at 1 800 333-0371 or by email at roadsafetywebmail@tc.gc.ca.